Many of our wonderful volunteers reading this already know and understand how GSMDRF works. But since our inception as a 501c3 four years ago, there are new Swissy owners who may not be aware of our procedures so following is a brief overview. These procedures have evolved over the years, but respecting the privacy of the surrendering home has always been a top priority. Owners surrender their Swissy for various reasons, some because of personal hardship, while others because of health or age and many because children are now part of the family. For most of these families it is a very difficult, agonizing decision and one that they haven’t taken lightly. Whatever the reason, rescue respects their decision and provides them with a way to give their dog up confidentially. 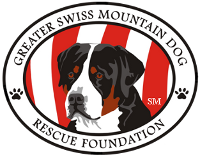 Before taking an owner surrender into rescue, the owner or GSMD rescue contacts the breeder to determine if the breeder is able to take their dog back. If the breeder doesn’t take the dog we then place the rescue in our foster program. The owner signs a surrender form and completes a behavioral profile which helps us get a feel for our new rescue. The procedure is the same for a shelter Swissy. We attempt to locate the breeder, but if unsuccessful the dog is placed in foster care. Our first choice for a foster is someone who either currently owns or has owned a Swissy. They are best suited to assess the rescue to determine where the dog will best fit, i.e. kids no kids, other dogs, no dogs, active lifestyle, more couch potato living. During the time the dog is in foster care, our foster families generously donate the food and rescue pays for vet bills and meds. Our fosters sign a foster agreement and the GSMDRF provides liability and accident insurance. While in foster care our rescues are spayed or neutered, brought up to date on their shots, microchipped and given a general physical with blood work. If there are any serious health issues, we try to take care of these as much as possible before looking for an adoptive home. Any underlying health issues are disclosed to the adoptive home in writing. When our foster family feels that their rescue is ready for their new forever home, they complete a behavioral profile which helps us determine where the dog will best fit. Once the profile is completed we go through our applications to find the home that we believe would be the best home for both family and dog. After speaking with the potential adoptive home we ask the foster family to speak with them as well. The foster family’s input helps us decide if this really is the best placement. Our foster homes are much more than a pit stop for our rescue Swissy until a home is found. They are vital to a successful adoption. They dedicate a lot of time working with their foster dog. Many dogs have lacked socialization during their previous life and the fosters know good socialization is a must for the dog to be successfully re-homed. It is not unusual for our foster homes to adopt their foster Swissy and although we potentially lose some really great foster homes it is definitely the best situation for the Swissy. On this website there are contact names and numbers as well as our e-mail address. If anyone has a question, concern or suggestions please do not hesitate to contact us. As most of you know, we are an all volunteer organization, but we try very hard to respond within a short period of time to any inquiry that comes our way. If anyone is interested in fostering or volunteering for transport or identifying a dog in a shelter, please complete the appropriate application that can be found on this website.